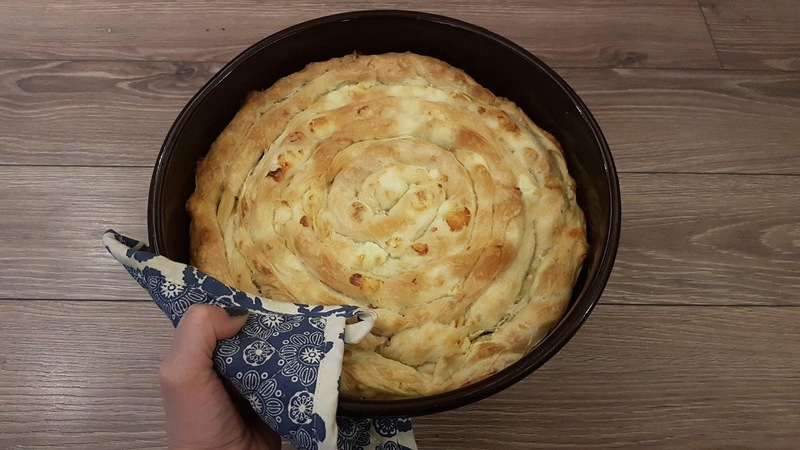 Maznik is a traditional Macedonian swirl pastry, made of thin kneaded dough, filled with white cheese, spinach, leeks or minced meat and then rolled in a swirl form. It's very popular, like zelnik or burek. 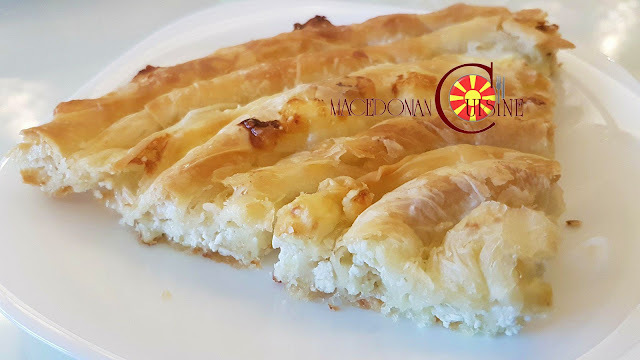 Homemade maznik is the best, you can't buy that good maznik in a store. 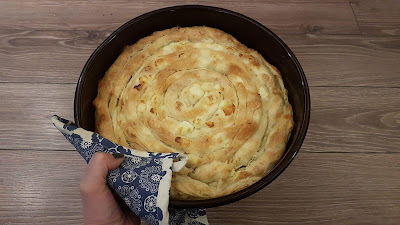 I have to admit, it's not an easy task to make maznik, especially if you're making it for the first time. That's why I'll show you step by step how to prepare maznik like a kneading master. 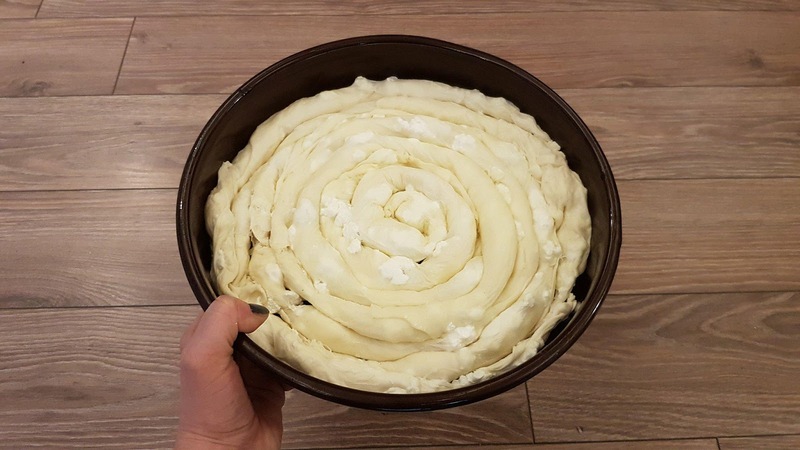 Place flour in a bowl and add salt and water. Add 2 tbs of oil. 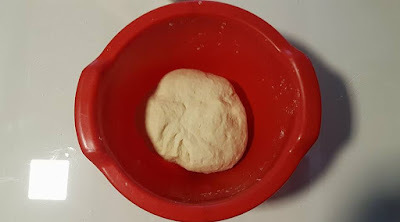 Add water slowly, not whole at once and start to knead the dough. At first your dough would be sticky and you'll think you might need to add more flour. Don't add more flour. Continue kneading. 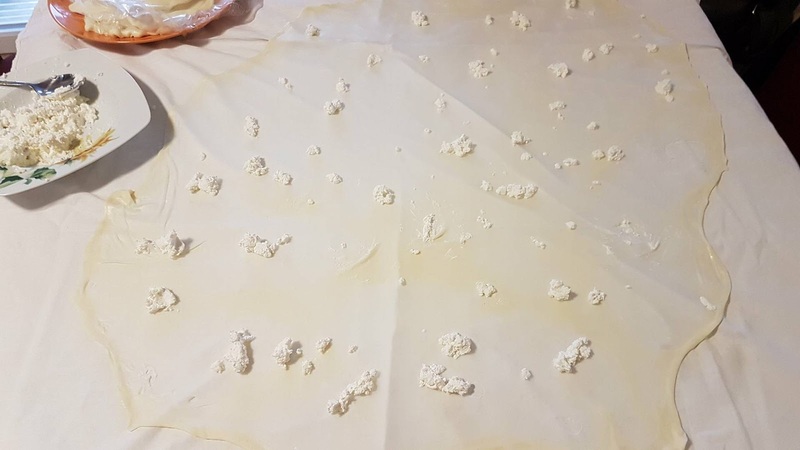 If it's still sticky after several minutes, you might need to add a bit of flour. Knead soft dough and leave to rest for 15 minutes. Form 6-8 balls from the dough. 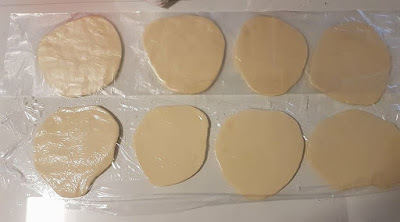 I made 8 since my table is not that big and you'll need a space when stretching the dough. 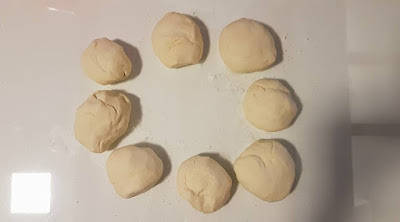 Make small disks from each ball (diameter 10 cm) by pressing dough with your hands or using a pin, then coat each disk with oil. 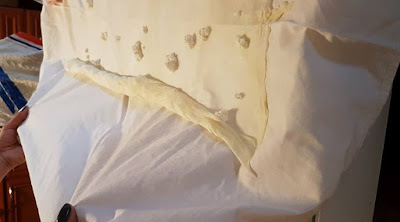 Cover with plastic foil to avoid drying. Leave to rest for about 30 minutes so the oil is soaked well in the dough. Transfer 1 disk to work on the middle of a table cloth. I used an old sleeping sheet. 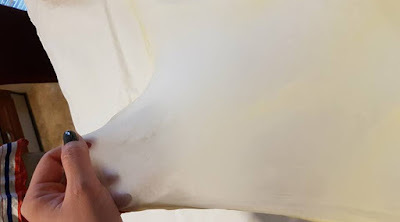 The idea of using a sheet is to easily make a thin crust that won't stick to the surface. First, take the disk and put your fist below in the middle and stretch the center of the disk. Using your hands, stretch it all over, then put it on the sheet. 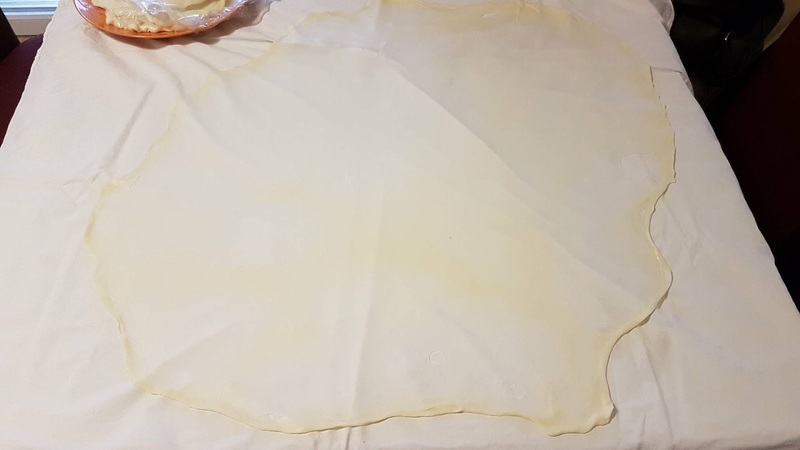 Then gradually start pulling the edges of the sheet until you get a thin crust. 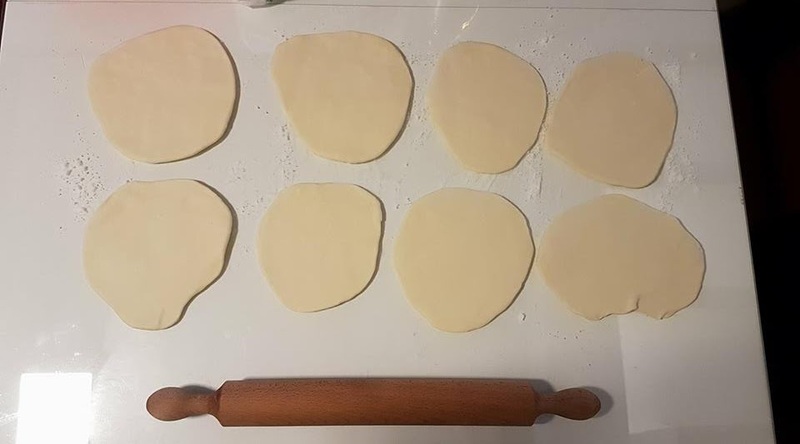 Remove edges of the crust (you'll use them later). Sprinkle crust with oil and apply the prepared filling. 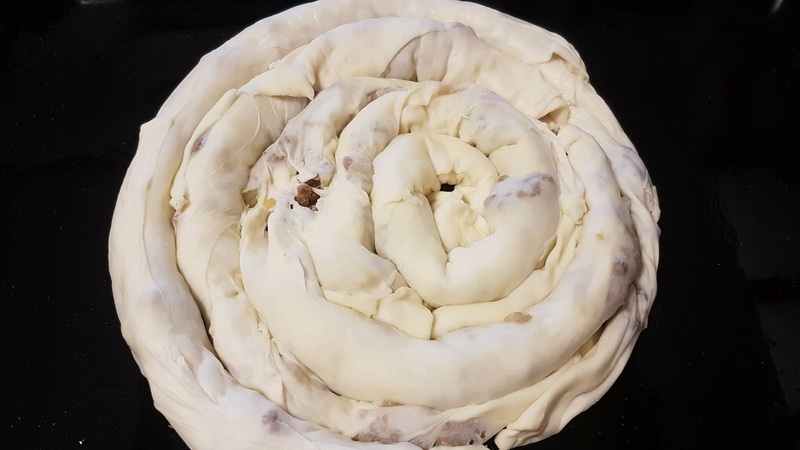 Bend crusts in a roll form using your sheet. You don't touch the crust with hands. 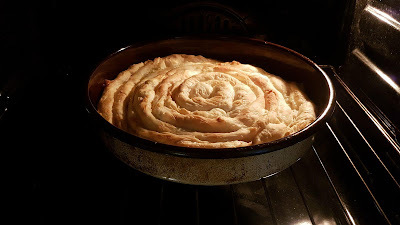 Then bend in a swirl form and put in a oil coated circular baking pan. Repeat the same with the rest of the disks. Sprinkle some oil and water on top before baking. 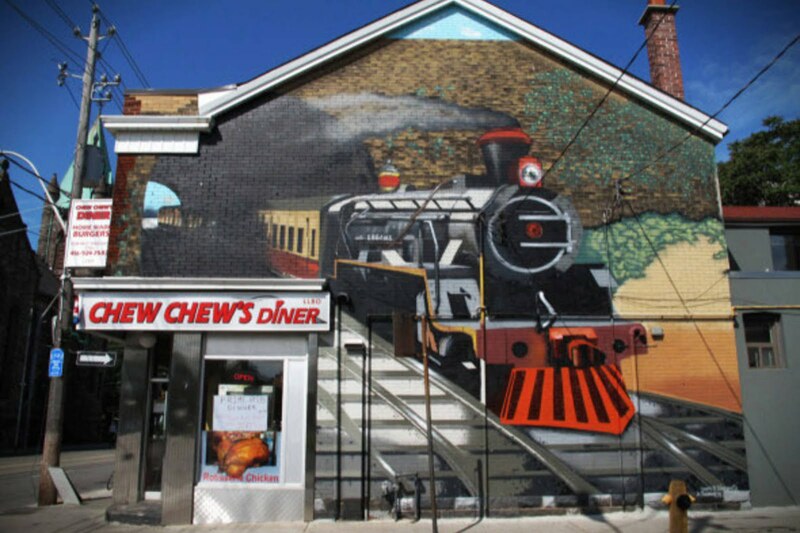 Don't forget to insert the coin if you're putting one. Bake at 200 C degrees for 20-25 minutes until maznik gets a beautiful golden/red color. 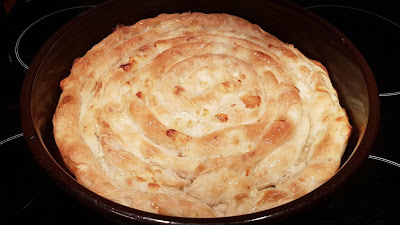 After baking, cover pie with wet kitchen towel, then serve. Serve with fermented milk. 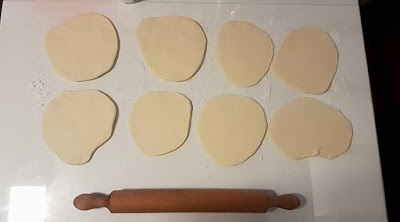 The edges from the crusts can be used again. I re-kneaded them, formed 4 disks, I coated them with oil and left to rest for 15 min. Then I made a smaller maznik with minced meat for my kids.